On the first weekend of August, I travelled down to Castle Road for their Summer Fayre, sponsored by Southsea’s Coastguard Studio. Castle Road is home to many popular independents including the infamous Pie and Vinyl (see my review as part of the Southsea Food Tour, coming out this Thursday) and Tony Wood hair salon in the old Victorian clock tower. There is also a tattoo studio, a cocktail bar, a sandwich shop, a pub and even a ‘Paint Your Own Pottery Studio’, each catering to different but overlapping markets and giving a very local twist on the phrase ‘something for everyone’. You might think that a slender side road in central Southsea couldn’t pack much more of a punch, but you’d be wrong. On the 5th and 6th of August, the road was taken over by market sellers, food stalls, DJs and musicians in a free event that’s fast becoming a must on the city’s annual events calendar. It’s been a fickle few weeks of Great British summer weather, but luckily the rain had passed as I set off for the Fayre. As I passed the Queen’s Hotel I could already hear the music blaring from the stage on Castle Road. Funk music was the first to greet me from the DJ’s of Shakara Soul, putting a swing in my step. Local names on the music scene rocked the rest of the weekend’s line-up, such as Apex Sun, DJ John Pryde, Shakara Soul and Beats and Swings’, and Tom Mayhem. The road was cut off with a large wall of street art featuring local artists. As I walked past, I was met by another, but this one was made of laughing, chatting people, drinking beer and eating hot dogs. I pushed through as the next band struck up on the music stage and boogied my way towards the stalls. The first stall I came to was a cider bar serving alcoholic slushies and, as the big child I am, I bought one. There was also the Gin Emporium in their van selling more gin flavours than you could count, with all the fruit and syrups you could ask for. The King Street Tavern were just a few steps away with their BBQ, selling pulled pork baps, hot dogs and corn on the cob. I saw many people walking past happily filling their faces with KST’s food, so I bought some pulled pork and gorged on it, my eyes rolling into the back of my head. Beyond the food, there were some unique sellers with vintage clothes, porcelain decorations and antique wares. 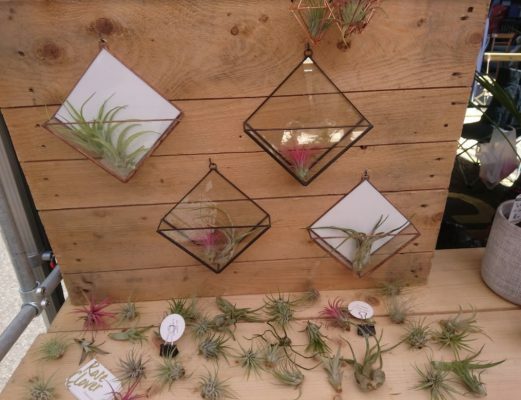 A few sellers that caught my eye were Angela Chick with her cartoonish styled shirts, bags and stationary, Forced to Be Fussy with their vegan cakes, and Rose Clover selling succulents and cacti. I didn’t buy anything but I was tempted by the vegan cake sets from Forced To Be Fussy – bags filled with dry ingredients to make things such as cookies or cakes. There were a few samples on offer, so I tried the lemon drizzle and was surprised at how moist and fluffy it was. At first glance, the bags might seem expensive at £10 each, but once you consider that you get a large batch of treats afterwards, it seems a bit more value for money. As someone who has no dietary requirements, I don’t know if this is cheap or expensive for vegan food. However, as their name suggests, the Forced to Be Fussy range is suitable for people who suffer from food intolerances, and I’d imagine the pleasure of being able to eat great desserts with no worries is worth paying for. The cacti from Rose Clover were very sweet and I was drawn to their small hanging succulents (see picture, right). For the kids, on another stall, there were some funky dinosaur balloons which tempted even me (I did mention I’m a big child, right?). The prices were what you would expect for market stalls with prices starting at around £5. But, the Castle Road Fayre wasn’t just about buying wares, like the markets we see more often in Palmerston Road. 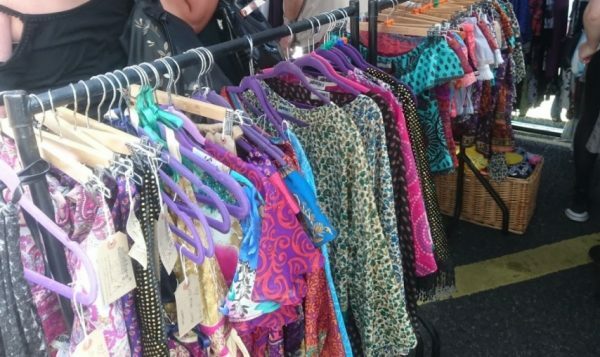 Although the market traders are a great addition the main vibe of the event centred on the colourful culture of Southsea – less about shopping and more about having a few drinks and dancing with your friends to good music. One issue for me was the lack of space and after a while, I felt a bit suffocated by all the people and slipped away to listen to the music from the green grass of the Common. Castle Road is a side street, after all, and can be cramped at the best of times, but add some stalls, a music stage and several hundred people and for some of us, it might be a bit claustrophobic. I was also told that this year’s event was smaller than last year’s, when the stalls and crowds stretched further along the road, rather than stopping just before the High School campus. The Summer Fayre was enjoyable but I didn’t stay all day, it was too busy for that. Though the crowd was busy and some of the stall prices were a little high, this event oozed character and fun that livened up a Southsea weekend in a unique and memorable way. The Castle Road Summer Fayre offers an independent, grassroots celebration of Portsmouth’s cultural scene featuring the best of local bands, food sellers and artisans. This sunny weekend feels like quintessential Southsea, and is crying out to expand further down the road once more in future years. As I chilled contentedly on the Common, finishing my boozy slushy and KST bap, and listening to the music drifting across the grass, I couldn’t have been happier.